Charli’s World: Let’s Scream for the Ice Cream Dream Team! My day started with a wonderful surprise! Ice cream! I spotted a blog post with a large photo of a dreamy, tasty Dairy Queen Peanut Buster Parfait! I had to go get one of my own! My photo is at the top but I don’t mind if you take a moment to check out my blogger friend’s photo and post. Go ahead and click here. Are you back? Or are you still drooling at the sight of the white creaminess, the lovely peanuts and glorious chocolate?! Yes, blogger Audrey Kletscher Helbling at Minnesota Prairie Roots did a fine job of getting me in the mood for spring and icy treats. I commented on her post and shared my favorite Dairy Queen story with her. She replied, “Thanks for sharing this fun story. It’s amazing what a simple gift to yourself, like a DQ Peanut Buster Parfait, can do for the spirits. 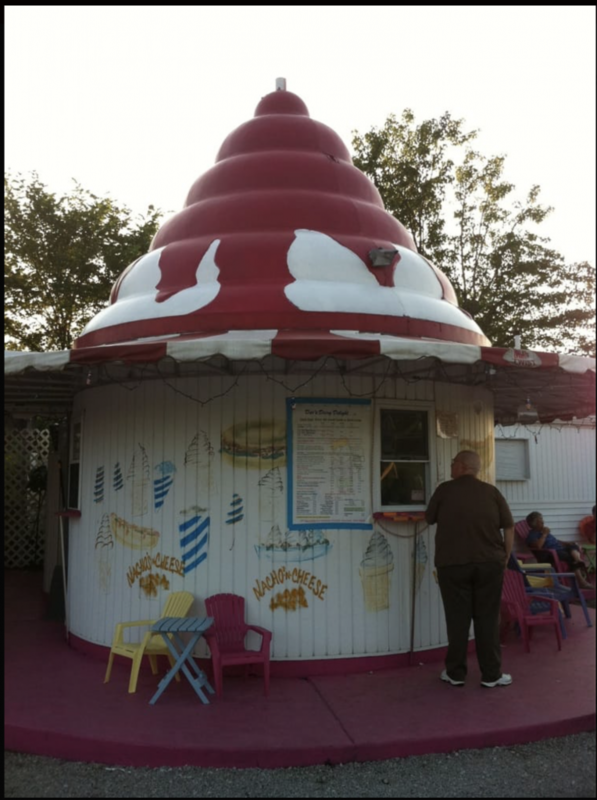 I am going to share my Diary Queen story with you and a few other ice cream memories. Get ready for lots of exclamation points!!! My first memory of going with with my family to buy an ice cream cone was a car trip to Isaly’s. Isaly’s has been around since the early 1900’s and many people through the years have shared their memories of Isaly’s. I loved their rainbow sherbet piled on a cone in their traditional “rocket” type scoop. Many other Isaly fans love their iconic chip chopped ham and Klondike Bars. Next, on annual family vacations to Lakeside, Ohio my family and I walked (I skipped) to the Patio to get orange sherbet ice cream cones after the evening entertainment at Hoover Auditorium. By the time I was in high school, I usually went on ice cream runs with my friends. We enjoyed a local place Barnhills, a fun place with a 1890’s theme. Barnhills introduced me to the large, multi-ingredient type of sundae. Me and my gang were thrilled when Baskin-Robbins 31 came to town. BR moved in to the same strip mall that had been home to Isaly’s, which had closed. Third-one new flavors every month- wow! Now each brand of ice cream in the grocery freezer aisle has at least that many flavors and concoctions! Pretty soon, we all could drive and we didn’t have to beg our parents to take a station wagon full of teens to get their treats. We found out about Strickland’s an iconic walk-up, seasonal soft serve ice cream place, with a weekly special flavor. Banana was one of the most popular flavors- we had to make a run whenever we heard that it was available. Wait- how did we find out about the special flavor without social media? Strickland’s parking lot was always packed. The original store had a great view of the Goodyear blimp air dock. College introduced me to Dairy Queen and the best sundae in the world! The Peanut Buster Parfait! My friends and I would study and then walk two miles to the DQ to treat ourselves. Yes, that was my first experience with balancing calories with exercise. Once I was married with kids, we had fun treating the kids to the same ice cream delights. What can be sadder than to see a beloved child’s big, sparkling eyes fill with tears as their amazing scoop of ice cream plops off the cone and splats on the parking lot? I have added a few other local, walk-up favorites through the years. Can’t resist one that looks like a cone! How does a fresh peach or strawberry sundae sound right now? And now for my most recent ice cream story, which brings back the Dairy Queen Peanut Buster Parfait after an absence of at least twenty years from my life. Here’s the story I shared with my blogger friend, Audrey. In January, my husband and I were driving to Florida. We were on the second day of our journey and had just crossed the Florida state line. We cheered but then realized that we had hours to go- Florida is a long state as I am sure many of you know. We grew tired and cranky, not so much “hangry” as “tranky”. My husband decided to stop for gas. We pulled into a tire-looking gas station. As we stopped at the pump, we debated about using the facilities. We looked to see where to go and then we saw it! Attached to the shabby convenience mart was a Dairy Queen! Yes, we had found our oasis. 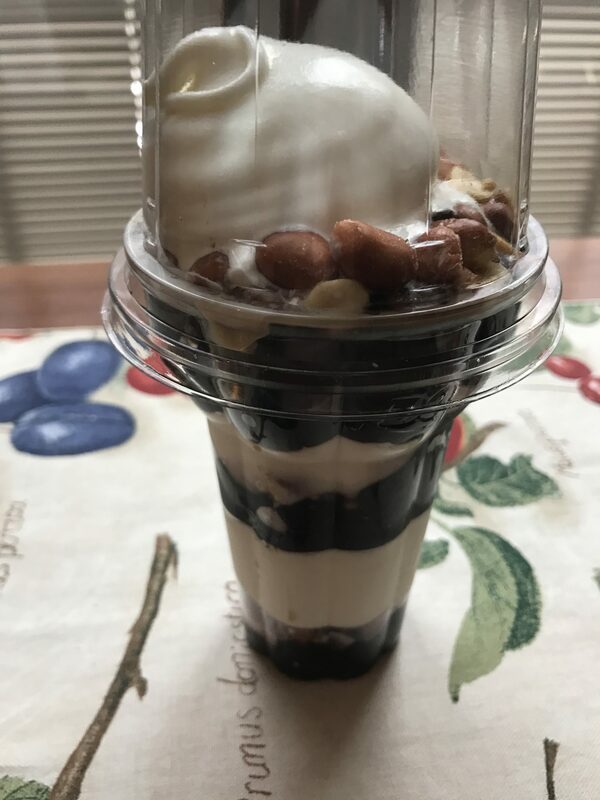 We didn’t listen at all to the voices in our heads that cautioned about calories and sugar- we dashed to the DQ counter and ordered two magnificent Peanut Buster Parfaits. Oh my, I’ve been to Paradise! Those sundaes were perfect and we made sure that each bite gave us the correct ratio of chocolates and peanuts. We revived and felt great, zest and happy. Three weeks later on the way home, we stopped again!! And now that I read Audrey’s post and saw her luscious photo, I am heading to Dairy Queen- with my coupon! What about you- I’d love to hear your ice cream or special treat stories! 12 Responses to Charli’s World: Let’s Scream for the Ice Cream Dream Team! Jena, those are great ice cream memories and a great DQ story! My husband and I use to hit DQ a lot in the days when we were dating. Their Peanut Buster Parfaits were awesome. I’m sure they still are, it’s just been years since I had one. Thanks Mae- I forgot about the ice cream truck-how exciting to hear the jingle. My girlfriend and Ibwould each buy a popsicle on the way home from school- 5 cents! I like root beer. Happy spring! Oh yes! The memories I have of ice cream. Fortunately, the most recent memories I have of DQ were associated with a dark time in my sugar addiction journey. A waffle bowl turtle sundae. It was an impulse stop not related to hunger or anything other than wanting a sugar hit related to the memory of cold delicious ice cream and warm fudge and caramel topped with real whipped cream and toasted pecans nestled in a chocolate dipped waffle cone bowl. Mmmm. Yes. A delicious thought. The reality of the sundae that impulsive other day of the week was a huge disappointment. It delivered the sugar hit, but not the taste I was expecting. That DQ had opted to use a substitute for real cream and it didn’t match up with my expected taste delight. Something was missing in the taste and texture of the waffle bowl. Or maybe it was added preservatives? Or the shame of knowing I didn’t want anyone to know I was eating it. (Speaking of disappointment and delight, it was a dis to my WW point counting and it de-lighted me into heavier.) DQ doesn’t tempt me in real time anymore, but I love the memories from the past without them hanging onto my hips. But ice cream in general? Or just in Maureen? I salute the idea with frozen fruit (mango, pineapple, strawberries, blueberries) and coconut milk in my food processor. Sometimes I even use real cream. A little vanilla extract and salt round it out to be a pretty sweet soft-serve without added processed (other than food processed) sugar. My favorite ice cream memories are from stopping for hard ice cream at any of the many ice cream shops in the Boston area, where I grew up. Howard Johnsons, Bergson’s, Brigham’s, Friendlies, Bubbling Brook. My most favorite memory was hard ice cream that was hard enough to take a big bite. I can’t quite describe it, but I sure can remember it. That’s another memory that I’ll just hang on to instead of it hanging on to me. As a member of Weight Watchers, I see and hear people talking about the new ice cream substitutes that are low in points. I look at the labels and lose interest when I see sugar as an ingredient. I’m not a fan of sucralose or stevia or other sugar substitutes. Besides, I don’t want to spoil my memories of the real deal. That’s enough for me! None of what I’m writing is meant to deter anyone from enjoying ice cream at DQ or anywhere else. I buy and store ice cream in my freezer to offer as a dessert when company comes. I don’t mind seeing people eat it. And I don’t mind remembering what it was like to eat it. I just don’t want the baggage that it comes with. Sugar is like a drug to me. And when I invite it in, it sticks around and doesn’t want to leave. It starts consuming parts of me that separate me from who I really am and who I really want to be with. I’ll leave it with a “thanks for the memories” and be happy with that. The memories of ice cream include not only the taste of ice cream but also the people I shared it with. My dad was a huge fan of ice cream. I remember my mother asking him to put the ice cream away after a Sunday dinner. He did just that. He put it away and there was none left in the carton! There are memories of stopping for ice cream at Farrell’s in Seattle when we went to visit relatives. And memories of stopping at Kimball’s on a hot day for gargantuan kiddie cones that required a fistful of napkins in the non ice cream cone holding hand. My parents’ weekly Costco trip after weigh in at Weight Watchers included a frozen treat as lunch. Even after my dad had a stroke, he longed for an ice cream to put against the throbbing pain in his head. His last days in rehab were made a little brighter because of the unlimited ice cream cups he could have. Mind you, he didn’t live for ice cream, but he sure enjoyed it! Oh my. I’ve written a blog post on your comments, Jena! Somehow, I don’t think you’ll mind. But if you do, just scream. For Ice Cream! Thank you Maureen! Loved hearing your memories-especially about your dad! As I said in my post- I hadn’t had a DQ PB parfait in years and years. But it was delicious and refreshing on our way to FL. HOWEVER I had -yes “had” to buy another one so I’d have a photo for this post, right?! And the second one had lost its luster for me- so ithat may be it for awhile. Until this summer when my favorite summer walk up has the fresh strawberry and peach sundaes. You certainly hold many DQ memories. Me, not so much. Rather, if we ever got an ice cream treat as children, it was from the home-grown Dari King in Redwood Falls, MN. Just as tasty. Cones for a nickel, a dime, a quarter. Given tight family finances, such treats were rare. I adore the ice cream shaped ice cream business. Where is this located? Thanks for the shout out directing readers to Minnesota Prairie Roots. The ice cream cone shape stands in Catawba, Ohio, near lake Erie. It’s a favorite, too. Of course you got my attention like Audrey did!!! You two are in cahoots to get me craving a DQ trip. My fondest memories of growing up include my daddy bringing home bags of Dilly Bars. That was a huge treat for this preacher’s kid, let me tell you! The last time I got one as an adult they appeared to be about half the size of what I remembered as a child. Could the shrinkage rate be that large in 50 years???? Of course The Patio is a favorite— Buckeye Bites all the way! Hi again Beth- I clicked reply too soon. Buckeye Bite- yes! See you soon the Patio I hope. Do you ever go to the Dairy Dock in Marblehead? My fave DQ treats were always dilly bars (loved to crunch the chocolate shell) and dipped cones (because, again, crunch the candy shell 🙂 ) When I was in high school I worked at a local place just like a DQ but not part of the franchise. Our soft-serve tasted a little different than DQs. We had people come from a neighboring town that had a DQ because our ice cream tasted better. I remember making PB Parfaits and buster bars (those frozen equivalents). Yum! I love ice cream memories. So many great ways to enjoy these treats. Now I want to go try a dilly bar!